Daisy MacDuff, widowed and lonely, reaches out to former friends scattered across the country. Daisy's husband was a civil engineer, and his work took them to a number of cities for three or four years at a time, just long enough to have made good friends. She values those relationships and has kept touch with friends through the years. Daisy grew up in Iowa, the daughter of a minister. As a seamstress, she thinks of herself and her former neighbors as remnants from divorce, spinsterhood or widowhood. They are all ready for a new life, in a new place and an easy climate. 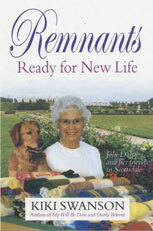 Daisy believes she has solved her problems of loneliness and managing her large home and property. In her Christmas letter of 2002, she invites nine of them to join her in a new retirement community in Scottsdale, Arizona. The response to her letter varies from "Never!" to "I might" and "Tell me more." Two of her friends are needed by their families and may never leave home. La Ventura is a typical new retirement center, complete with its own bank, postal station, beauty salon and barber shop, first aid center and pool. Pets are welcome in the main floor units. An ice cream parlor, a good library and a fitness room provide common meeting areas. Movies are shown regularly, and speakers and classes complete the offerings. Covered parking places add to the amenities. An excellent chef keeps the residents happy. Daisy and her Golden Retriever Curly move to La Ventura in January, 2003. In the following year, four of her friends join them. Beth O'Donnell comes from Geneva, Illinois, as her first big adventure after a hip replacement. She is still using a cane occasionally, but she finds the new building has been designed for smooth walking and safe pathways. Daisy feels close to Beth, and her arrival is reassuring. Next to arrive is Ellen Crane, widow of the Reverend Joshua Crane, a Presbyterian minister in Atlanta, Georgia. Ellen has suffered from arthritis for the past ten years, and she is hoping the dry climate will be a comfort. She explains the reference to remnants as a Biblical reason for their new lives together. Mary Ann Martinez from Roswell, NM and Daisy have kept in touch at Christmas for many years. Martha Costello joins her sister from Madison WI, and she immediately finds friends who have shared her problems with addiction. As a professional counselor, she forms a twelve-step group and begins work as a volunteer. By the following winter, Clarissa Benton comes from Silverdale, Washington, in high hopes of getting relief from her arthritis. She is a retired piano teacher, lately turned into a Master Bridge player and teacher. She soon organizes the bridge players into a weekly group. La Ventura may look like a perfect setting for a flawless retirement, but it is subject to life's complications and the roller-coaster news of the early 21st century. Donna Krueger remembers Daisy's invitation, and when she loses her only son, she realizes she needs old friends. She and her ancient cat arrive fourteen months after Daisy's invitation, and she brings another dimension to the group, a younger point of view. She yearns for self-fulfillment and yet is reticent about opening up to share her life story. A writing group in La Ventura encourages residents to write their life stories. Daisy's friends agree to share theirs, since they are new to each other. As others hear of the small group's fun in writing, they are joined by several men and another friend of Daisy's. They record their opinions of successful living and descriptions of their mentors as they grew up. Together they face the challenge of writing their last wishes and finally their own obituaries. Into their third year of sharing, they realize they can enjoy the rest of their lives without worrying about their "last plans." They have left their heirs a written legacy. They become volunteers at a local agency, the nearest Boys & Girls Club as well as at Vista Del Camino. Christmas gifts to the children seem far more exciting than a personal gift exchange. Some of the residents join churches. Curly is trained to visit patients with Daisy in the new skilled care unit. Volunteer work is always rewarding, and it keeps them from feeling shut in on their campus. The single women admit they weighed their decisions cautiously. Around the pool, they learn that it is not any easier for couples to make the big move to come to La Ventura. A few of the new residents are slow to blend into the activities. The remnants are now ages 71-83, and they are still actively involved in Scottsdale, their churches, La Ventura classes and social life. The magic word is together. Readers may recognize themselves and their neighbors in the individual stories of how these remnants take on new life. They came from disparate backgrounds and careers. Their attitudes about money and marriage are varied. They had been living lives centered on themselves, but they find that compassion for others restores their own strength and optimism, giving them a reason to start each day. Their activities as volunteers add new dimensions to their days. The book opens with a question: Can a Christmas letter change the lives of friends? This one did!